How to Fix Zip File Association? Zipping multiple files in .zip file format is one of the most convenient ways of storing huge amount of data in less space. This file management technique is commonly used for compressing multiple files into a single folder. Zip files help users to keep number of files together and makes tasks such as transferring, downloading, uploading, storing and emailing easier. Nevertheless just like any other files even Zip files cannot escape from problems such as corruption or damage. There are many reasons for a Zip file to get corrupt and one main reason being Zip association. Zip file association refers to opening a Zip program on incompatible application like making Windows Media Player the default application to open your important Zip file. This makes your Zip file corrupt, sometimes non-associating the Zip archive will help you resolve the problem. However in case your associated Zip file is still corrupt, then you can make use of Remo Repair utility to fix Zip association. Other than Zip file corruption, there are many reasons which makes your Zip file corrupt or damaged, some of the other reasons include broken (CRC error) or incomplete Zip file download, virus infection on Zip file header, bad sectors on storage drive where your Zip files are stored, power failure, improper system termination while transferring Zip file and many others. 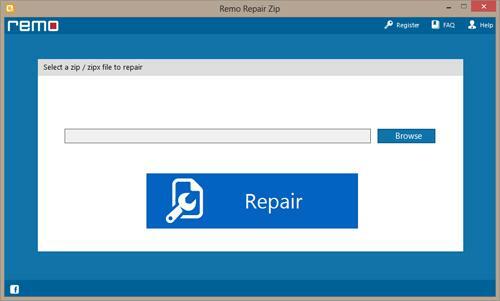 Remo Repair utility is a fast application to fix zip association on Windows based computer or laptop. The application is equipped with powerful inbuilt algorithm that repairs your corrupt Zip file created by using any WinZip or other file compressing utility. This software is designed with simple, easy to use and user friendly graphical interface through which even a non-technical person can fix his associated Zip file successfully. This program supports mending of both .zip and .zipx file types. It even has the ability to fix password protected and encrypted Zip archives. Furthermore, Remo Repair application is compatible to run on all flavor of Windows operating system such as Windows Server 2003, Windows XP, Windows Vista, Windows 7 and also the latest one Windows 8. Why Remo Repair is best for fixing Zip file association? Note: The free demo version of Remo Repair software is technically similar to full version, except that saving of repaired Zip file is disabled. In order to enable "Save" option, you have to register for full version. 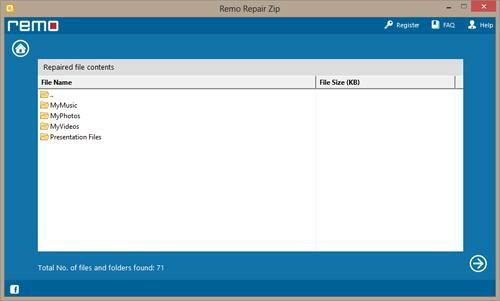 Step 1: Download and install Remo Repair Zip software on your system. 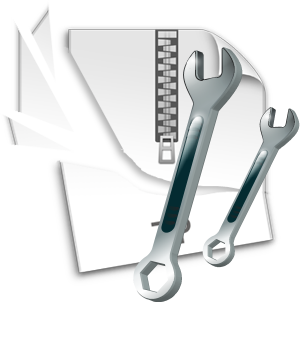 Launch the application and choose your corrupt .zip or .zipx file, which is to be repaired and click “Repair" option to begin the repair process. Step 2: The software starts scanning and fixing all problems associated with the selected Zip file. Step 3: After completion of file repair process you can preview the repaired Zip file. Step 4: And finally store your repaired Zip file using “Save” button.